It was great to see so many people turn up for the Europe of Freedom and Direct Democracy Roadshow held at the Key Theatre earlier this month. More than 180 people came from Peterborough and the surrounding area, with 88% opting to leave the EU at the end of the evening. It was good to see such local democracy in action. 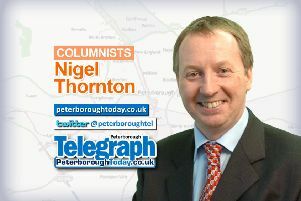 Mark Edwards, the Peterborough Telegraph editor, raised some important concerns in his editorial comment last week. The ongoing sorry saga of the old Peterborough District Hospital sell off, continues to beggar belief. Community facilities and the provision for affordable housing have been shelved by the developers. Their original costings for the site and empty promises for its social development leave a lot to be desired. Affordable housing is desperately needed in Peterborough for the many local residents without access to good housing in the city. The provision of a decent place to live should be a fundamental right in this country today. Poverty and poor housing are endemic in some parts of the city and affordable housing is the first step of getting people back on track, and helping them to escape the miseries of poverty and deprivation. Planning applications for new developments should not be passed unless cast iron guarantees of the provision of affordable housing are written into these contracts, with harsh financial penalties imposed should these provisions be bypassed. This is the only way to ensure that developers live up to their responsibilities and provide the levels of housing so that everyone can benefit, both private owner and social housing tenant alike. News of a disabled man who was robbed of his iPad whilst in his wheelchair in Park Road on Tuesday 25th August sickened me. The iPad was his only way of communicating with people and this cowardly thief has deprived him of this. These types of crimes are becoming increasingly common in Peterborough and this thug must be caught and severely punished as a deterrent to others. I have opened an appeal to try and raise enough money to buy this gentleman a replacement iPad so he can get back to communicating with people as soon as possible. Please donate generously at http://www.gofundme.com/yg4457zg if you can. Any donation whatever the size will help. I’ll let you know in my next column how we got on.